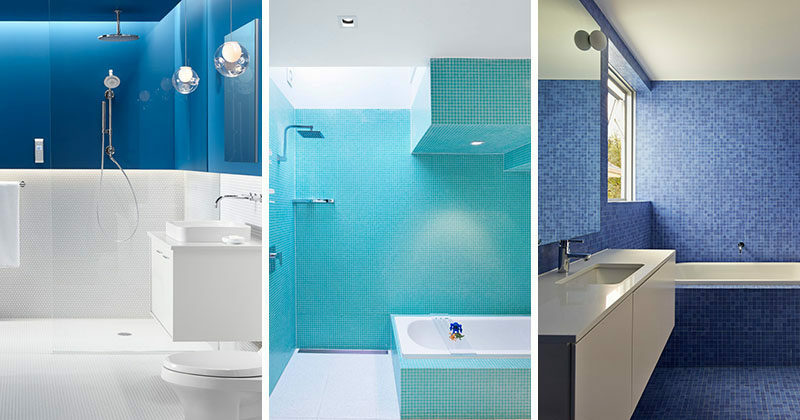 Here are 13 examples of blue and white bathrooms to get you inspired for a colorful bathroom makeover. 1. 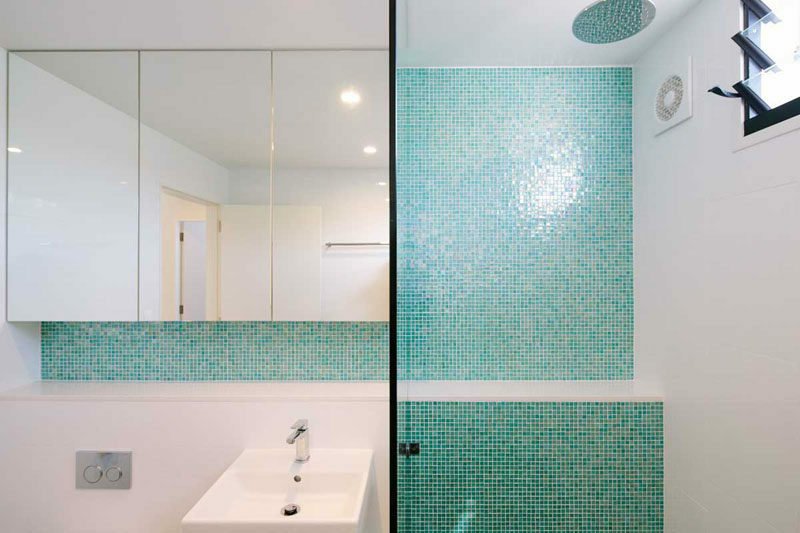 This white bathroom is broken up with an entire wall of blue glass tiles arranged in clean lines to help create feelings of calmness. See more photos of this home, here. Designed by DEN Architecture. 2. 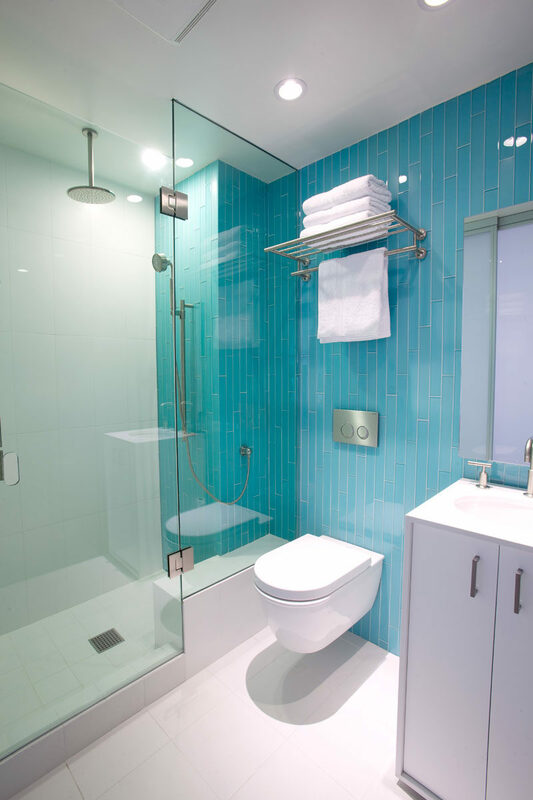 The commitment to the blue and white theme is evident in this bathroom that used blue grout between the white tiles in the shower. Designed by studioWOK. Photography by Federico Villa. 3. 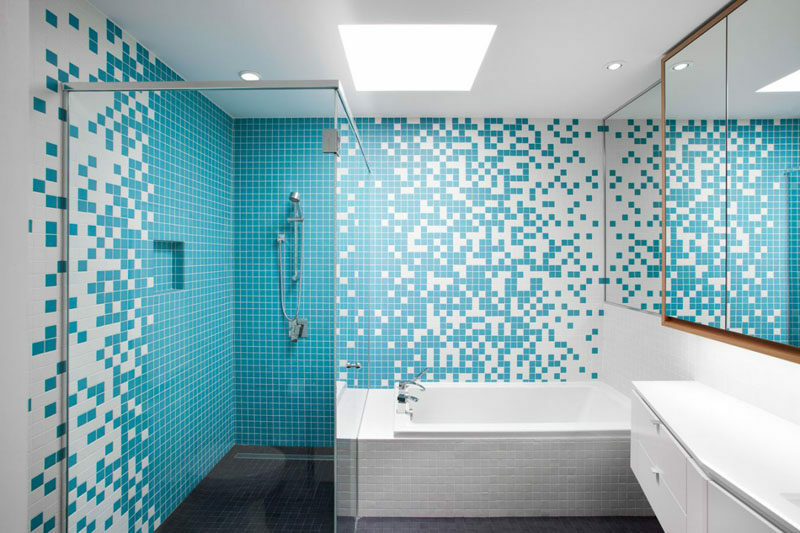 Blue tiles arranged in an almost pixel-like way, liven up the bathroom and make it more fun than relaxing but still a nice place to start the day. See more photos of this home, here. Designed by naturehumaine. Photography by Adrien Williams. 4. 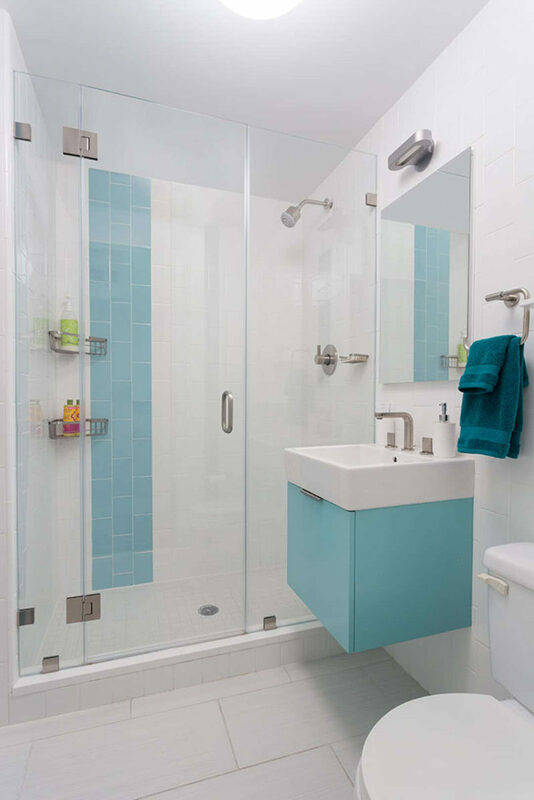 A strip of blue in the shower and a blue cabinet add a fun touch of color and break up the all white space. See more photos of this home, here. Designed by Ben Herzog Architect and Kiki Dennis Interiors. Photography by Brett Beyer. 5. 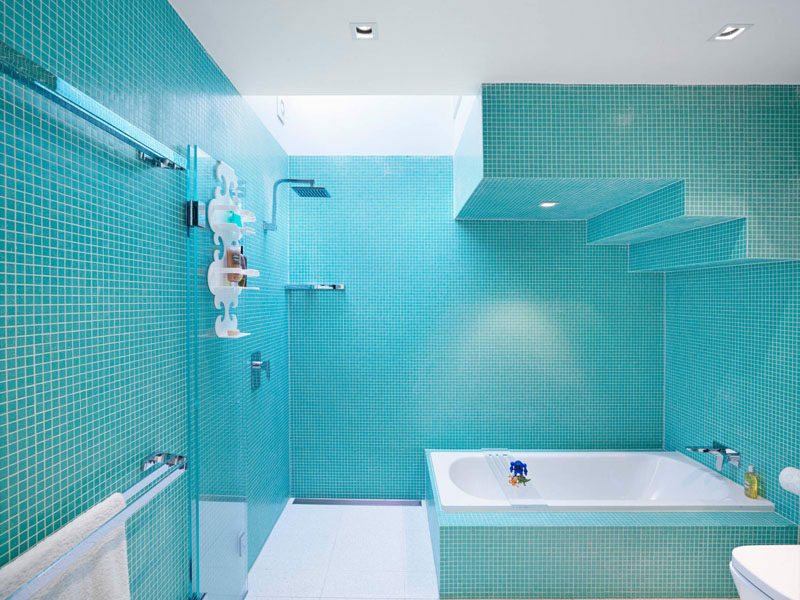 An accent wall of aqua blue tiles in this bathroom adds color and a focal point, as well as helps to create a relaxing little oasis. See more photos of this home, here. Designed by HYLA Architects. Photography by Derek Swalwell. 6. 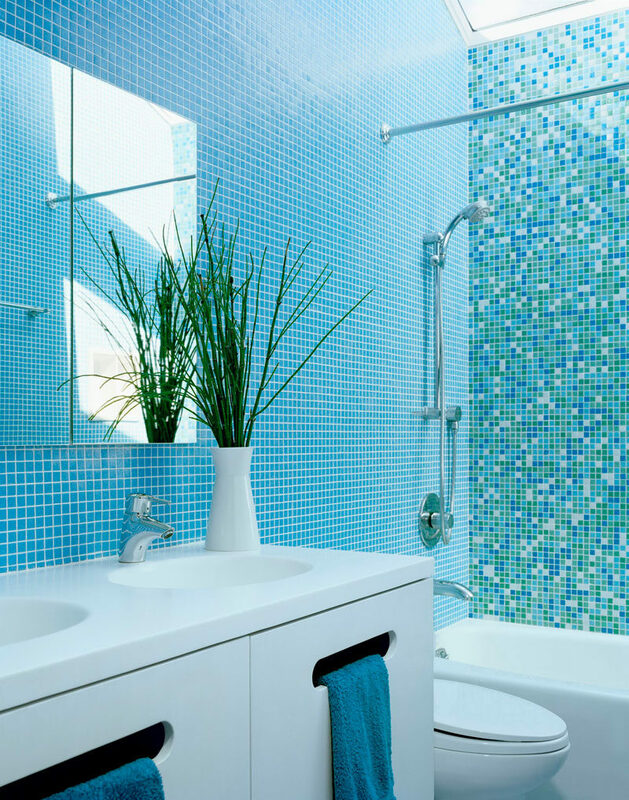 Long blue vertical tiles line this bathroom wall and add an invigorating pop of color to the space. Designed by Whitten Architects, Inc. Photography by Darren Eskandari. 7. 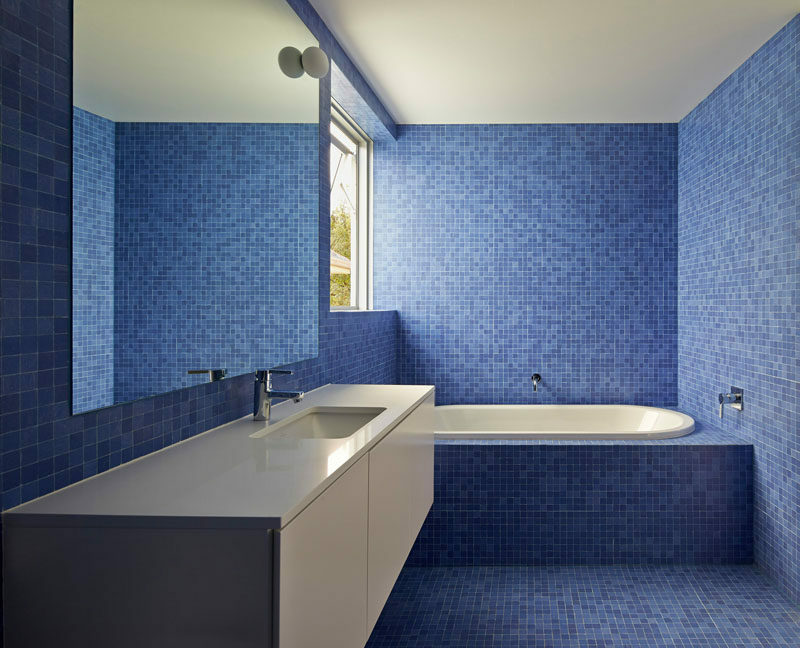 Deep blue tiles and blue doors in this bathroom add a punch of color, while the large soaker tub helps keep the space feeling like a relaxing place to unwind. 8. 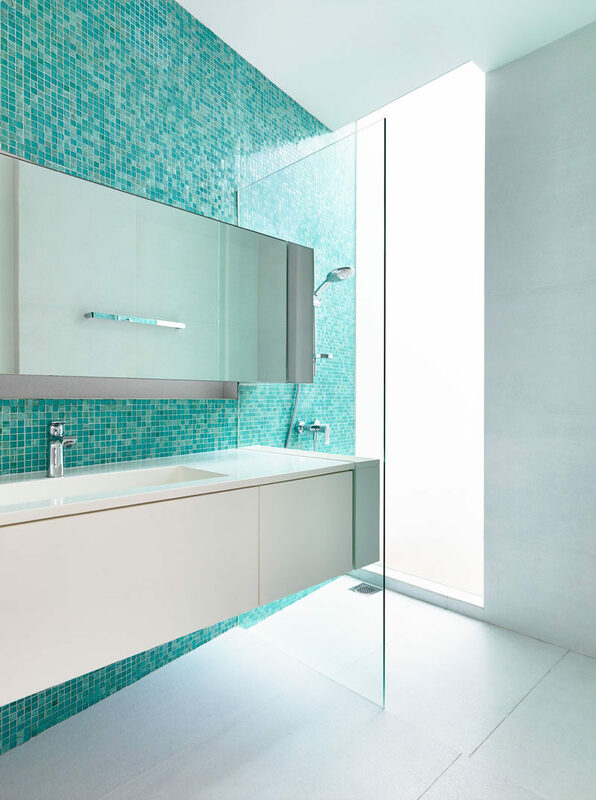 Light aqua tiles line the wall of the shower and the backsplash of this bathroom helping to create a unified, relaxing space. See more photos of this home, here. Designed by Davis Architects. 9. 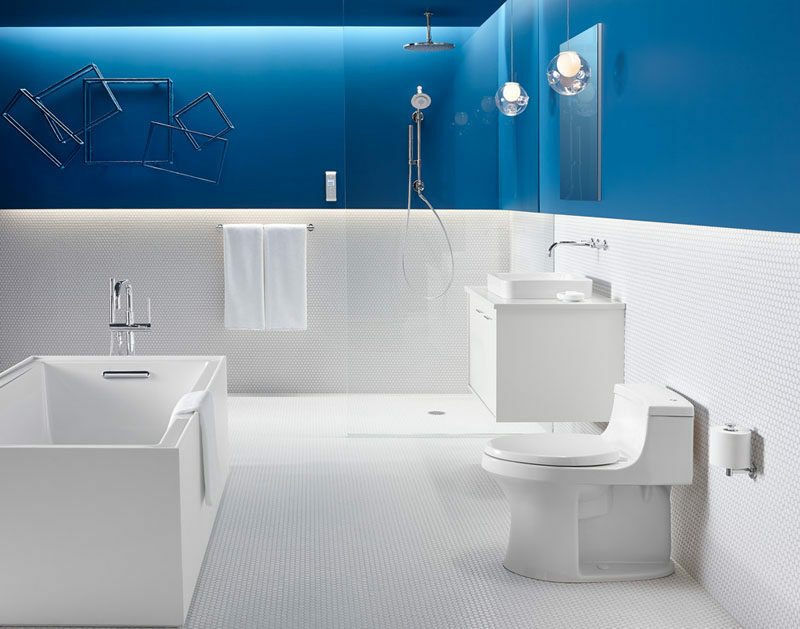 Blue tiles covering the walls and tub of this bathroom make it bright and playful, while the white bath, shower floor, toilet and caddy help make the space feel clean and fresh. Designed by Elaine Richardson Architect. Photography by Florian Groehn. 10. 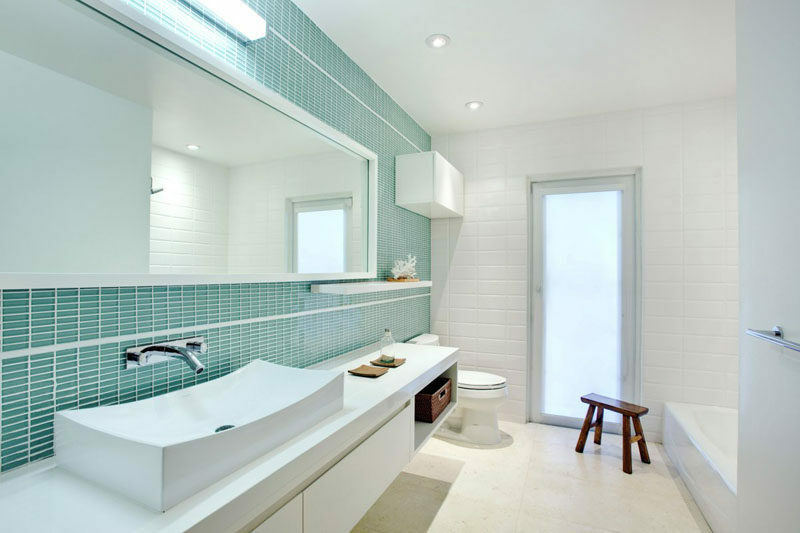 Blue tiled walls broken up by an accent wall of different shades of blue tiles, coupled with the white vanity, make this bathroom fun yet calm. Designed by Ogawa Fisher Architects. Photography by Joe Fletcher. 11. 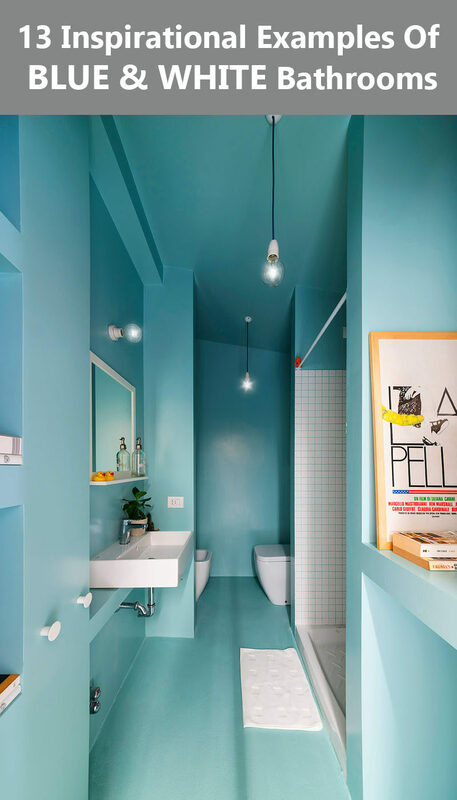 This white bathroom is interrupted by blue that continues all the way to the ceiling. 12. 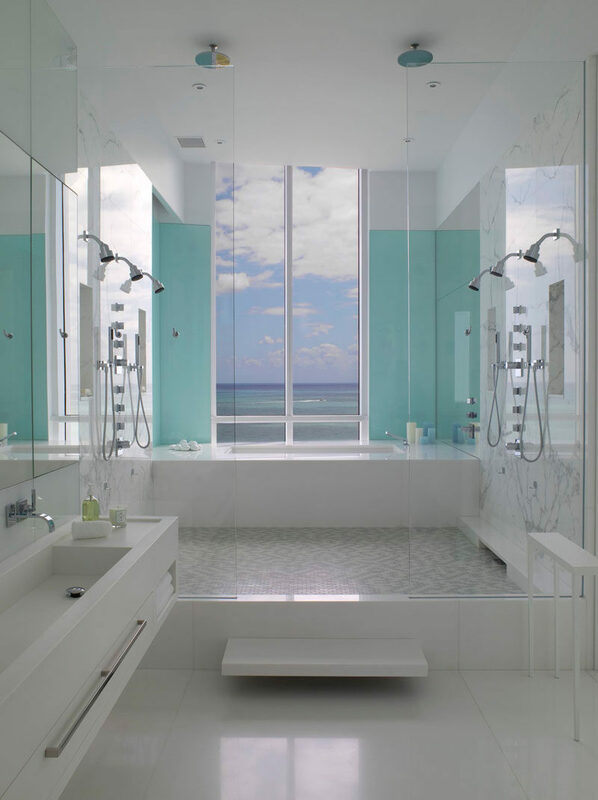 Two light blue panels flank the window of this bathroom, drawing your eye to the window and framing the incredible view just outside. Designed by Jennifer Post Design Inc. Photography by Ken Hayden Photography. 13. 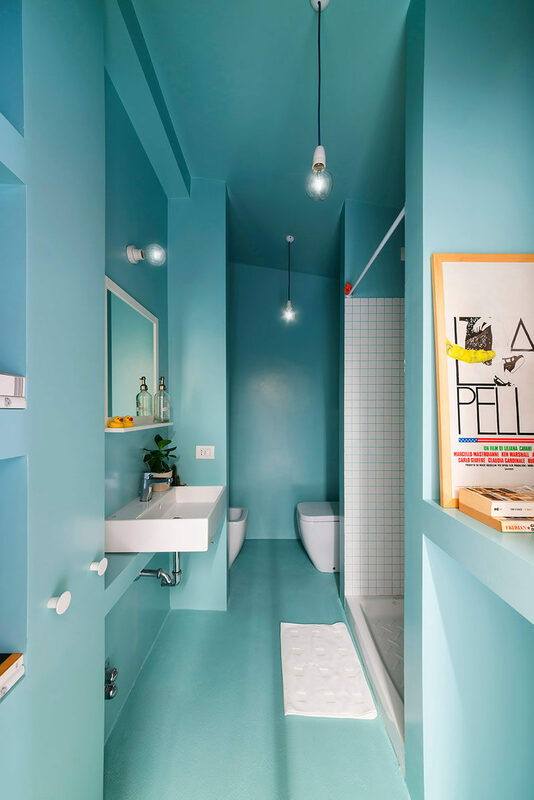 Various shades of blue tiles line the walls and floor of this bathroom, creating a fun atmosphere with a touch of sophistication thanks to the white tub and counter. Designed by Bennett and Trimble. Photography by Peter Bennetts.